Believe it or not we actually ventured in to the Mall of America with the sole intention of visiting the new Nickelodeon Universe. The nice thing about this theme park is there is no admission. You can walk through without paying a dime. If you want to ride… Well, that will cost you. We bought a “Comet Package” (35 points) for $31.50 plus tax. Because the average ride is 3 points this pass didn’t last long. If you plan to spend an entire day at the mall or if you have older children I would splurge on the Unlimited Ride Wristband for $29.95 each. 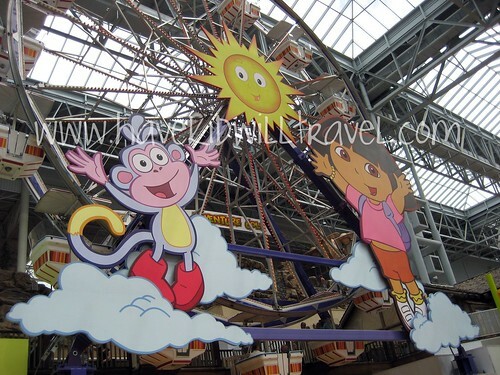 Nickelodeon Universe has all your favorite Nick characters hosting their own rides as well as a few “old favorites” like the Big Rigs and the carousel. Our first order of business was to find the Backyardigans. 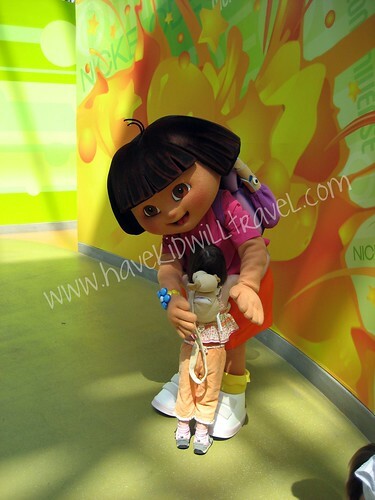 But as we were making our way through the park we saw Dora- live and in person! There are two spots in the park where you can meet your favorite characters, give them hugs and have your picture taken. 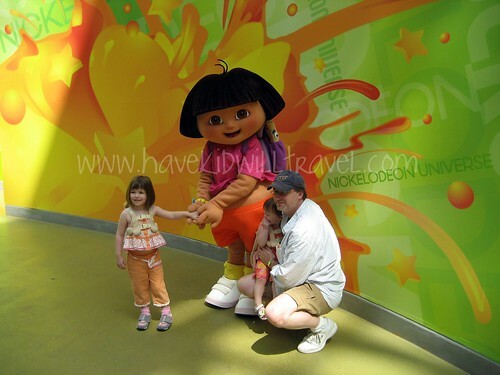 Brenna was very excited to meet Dora! After saying goodbye to Dora we found the Backyardigans Swing-Along. And then the Big Rigs. This was followed by a classic carousel and then the El Circulo del Cielo (ferris wheel) with Dora. These four rides consumed our points (and Doug got to ride the Big Rigs free with Caelan and we both rode the carousel free with the girls)- they go fast. Luckily, for our girls, that was enough and we got to go on with our day. 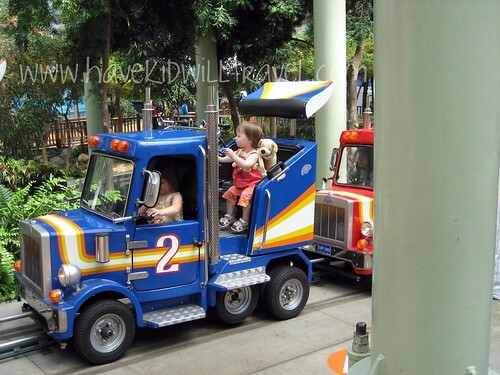 There are 7 rides that allow a chaperone to ride for free with small children. Tickets can be purchased at self serve kiosks with a credit card. 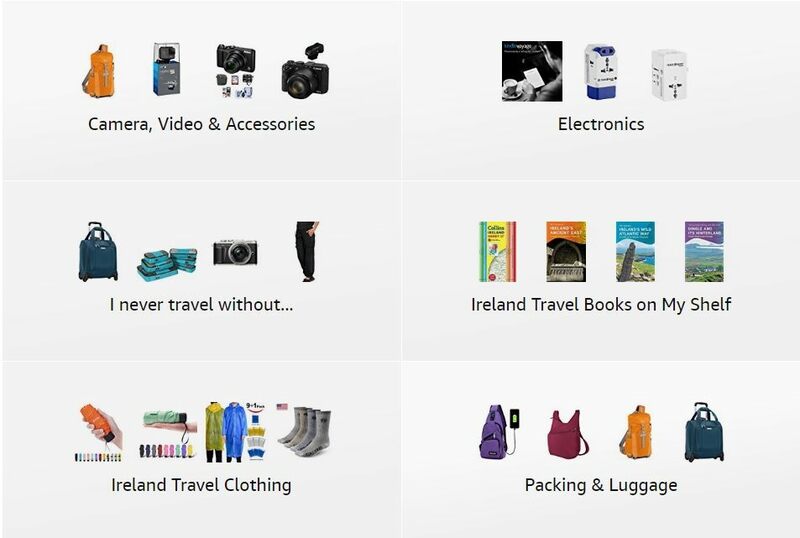 If you prefer to pay cash you have to brave the largest Nickelodeon retail store in the country or guest services. There are two restrooms in the park itself as well as two ATMs. Within the park there are 3 places to eat: Eats (a wide variety of foods), Caribou Coffee and Kemps Ice Cream Cafe. You can shop at 5 Nickelodeon stores- including the flagship store with the most Nickelodeon merchandise you’ll find anywhere! If your teens are too cool for the rides there is a huge arcade with all the hottest games. If you’re looking for better food than you can find in the park or upstairs at the food court allow me to suggest the California Cafe. It is just upstairs from Nickelodeon Universe (their patio overlooks the park) so you don’t have to go far. The food is exceptional (the Chicken Tostadas and Salmon Enchiladas we had were so fresh and yummy!) and the kids meals (presented in a bento box) are healthy and kid friendly. And if you’ve got a budding architect in your family be sure to spend some time at LegoLand, right next to Nickelodeon Universe. You can play with Legos, buy Legos in bulk and marvel at the Lego creations. 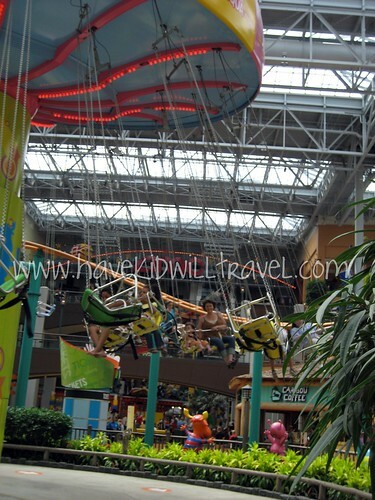 My family recently visited the Nickelodeon Universe at the Mall of America and had a blast! I actually used to work at this massive mall 60+ hours per week in my early 20s when I lived in MN. I took for granted how much fun the mall can be. This was my family's first time visiting the amusement park since it switched from Camp Snoopy and I liked it much better than before. There are more fast rides for grown-ups and big kids (like my triplet neice & nephews) than before, but still lots of fun rides for little ones (like my 4.5 y-o & 18 mo-o). Thanks for the tips on enjoying the indoor amusement park!